My Plant Has No Flowers! Comments for My Plant Has No Flowers! Don't Lose Faith In Your Phalaenopsis, And Please Do Not Throw It Out! 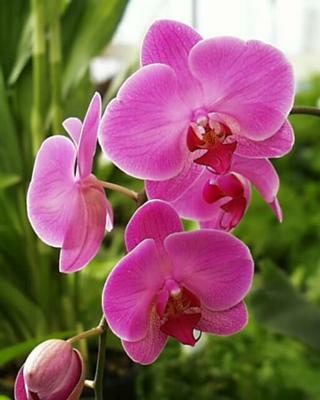 Thanks for your question and the beautiful picture of a Phalaenopsis Orchid. Even if the picture is not your orchid it is a beautiful picture of a pink Phalaenopsis. If you bought your Phal. in bloom, blooming for two months is great. It sounds like the blossoms have fallen off in the natural course of the plant's life. Most Phals. bloom once a year (some more often) and often the blooms will last 2 to 4 months in the right environment. The tall stick left is the spent flower spike. The fact that the leaves on the bottom are very healthy and new ones have just recently sprouted is a very good sign that the plant is growing normally. It is definitely not dead. I am sorry if this is frustrating to you but the plant is just being the plant and it is reacting in the normal cycle of time. You know the saying, "To everything there is a season". Don't loose faith. Just learn to figure out what Phalaenopsis need to thrive. They are wonderful orchids, easy to grow, good for beginners and have wonderful flowers that last a long time. PLEASE DON'T JUST THROW IT AWAY. If you really just want one in bloom then just go and buy another if you can. Perhaps you can find someone who wants to try growing it and reblooming it. It is after all, alive and just wants to be a happy little plant. If you are interested in trying to grow this plant and try to rebloom it then check out my Phalaenopsis Orchid Care page. It has lots of free information on what Phals. need and how to grow and hopefully reblooming these lovely orchids. Or if you give it away, please refer the new owners to this page if they need help. So to this plant back to the beauty you know it can be will just take time and care. I can tell you that it is VERY exciting the first time you rebloom an orchid. If you have more questions about growing them I am happy to try to help.